Here's where to watch every episode of The New Addams Family season 1. Mouseover or tap an episode to see where to stream it. Click or tap the play icon to stream it on the best available service. The Addams Family Goes to School Oct 21, 1998 The school board finds out that Wednesday and Pugsley have never been to school, and insists that they be enrolled immediately. Gomez and Morticia are rightly concerned about how the first day of school would be for the kids. Wednesday and Pugsley return with the horror of a dragon being killed in Grimm's Fairy Tales. But everything is straightened out when the school board reps come to the Addams house. Fester's Punctured Romance Oct 22, 1998 Fester broke up with his girl friend Cruella and goes into a state of depression. The family tries to help him out, and everything looks real rosy when it appears that Lucretia, Fester's date by mail order has arrived. Just to make sure, Mama mixes up Love Potions 666 and Wednesday administers it. Grandpapa Addams Oct 26, 1998 Grandpapa Addams comes to stay with the family while they rebuild his neighborhood. The family knows he still misses his late wife, and make arrangements to surprise Grandpapa with a a gift to him of two weeks at Club Dead - a swinging resort for singles over 50. Grandpapa finds out but mistakenly thinks he's being sent to a nursing home so then tries to prove his youth to the family and pretends to be 50 years younger. 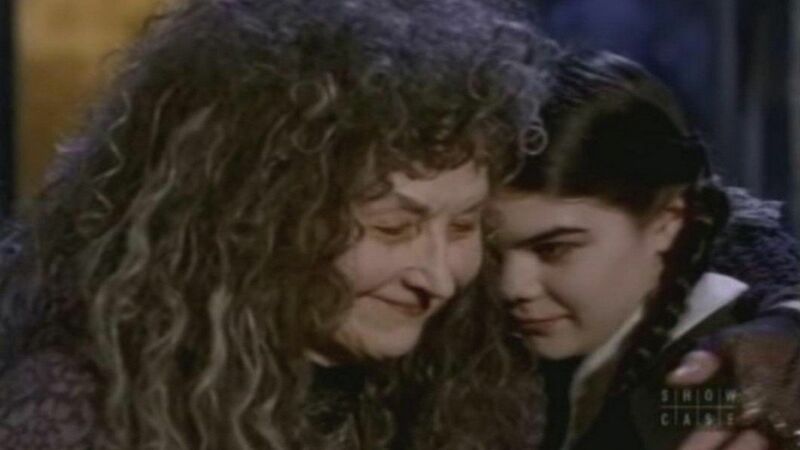 Gomez, the Reluctant Lover Oct 27, 1998 Pugsley comes home with a crush on his teacher. He takes one of the love letters that Gomez sent to Morticia, and sends it to his teacher. When she comes to the Addams family house to inform them about it, she is led to believe that Gomez sent it. She falls for Gomez. Mama and Morticia tell a reluctant Gomez to go right after her and she'll run off. Morticia, the Matchmaker Oct 28, 1998 Cousin Melancholia's fiancee ran out and left her, so she shows up at the Addamses house all despondent. They try to find her another suitor - the mailman who zooms off, Lurch wouldn't agree, Fester only dates criminals, and Thing fingers off. But the unwilling Ralph Harvey, trying to save his Law Firm's account with the Addamses, is coerced into dating and getting engaged to Melancholia. The Addams Family Tree Oct 29, 1998 Wednesday gave Harold Pomeroy a black eye at school after he said his family was better than hers. His smug father, Cecil Pomeroy comes to the Addams family house for an apology. Cecil and Harold get to ""enjoy"" the family Addams. But with their interest now aroused in their own genealogy, the family hires professor Sims to do some research for them. Cousin Itt Visits the Addams Family Oct 30, 1998 While Mama gives everyone extremely inappropriate gifts. Cousin Itt's girlfriend Contessa threw him out because she found out about Eudora and Simone and Lucinda, Monica and Cosuma. He came over for a place to stay since he was also broke, having lost his entire fortune at the roulette table. So he tries to get a job - at a Burger joint, then as a receptionist, then a hair stylist, and finally at the zoo. Art and the Addams Family Oct 30, 1998 Wednesday comes back from school after painting a black rainbow and she got an ""F"" on it. Her teacher, Miss Crank, says she may fail art if she doesn't use color. So Gomez tries to hire the world famous artist Leopold DaMinci as an art Tutor, but gets Leo DaMinci, an Italian Pizza delivery man instead. Meanwhile, Mama falls in love with the postman, and Fester helps her try to trap him. Thing is Missing Nov 2, 1998 Its Thing's birthday. Thing opens Fester's mail and Fester and the family yell at him and none of them remember his birthday, so Thing runs away. The stress of fighting with Thing causes Fester to start growing hair on his head. Fester Goes on a Diet Nov 3, 1998 Changing the name on this one as this order makes no sense to me now but this episode is missing and the name here was a duplicate. Morticia's Romance (1) Nov 4, 1998 Gomez and Morticia are celebrating their 13th Anniversary. Wednesday and Pugsley ask them how they met. So they are told the story. Gomez was pre-ordained to marry Morticia's sister Ophelia for whom he had no affection. But he and Morticia were love at first sight. Morticia's Romance (2) Nov 5, 1998 Wednesday and Pugsley ask to hear the rest of the story about how Gomez and Morticia met. The story continues with the complications that arose when Cousin Itt and Cousin Vlad became involved. Wednesday Leaves Home Nov 6, 1998 Wednesday unleashed 20 starving alligators in the sewers. The police came after her. Gomez and Morticia ground her for a week for cruelty to animals. She would not be allowed to play with her weapons, start any fires, or torture here brother. So Wednesday runs away. My Fair Cousin Itt Nov 9, 1998 Cousin Itt was very disappointed that he didn't get the role of Hamlet at the theatre. So Gomez dusts off an old play he wrote, casts Itt as the lead, and hires a director for it. The director refuses to work with Itt because his voice is not deciferable. So Morticia trys to get Itt to slow and lower his voice. Itt's voice changes, but so does his personality. The Winning of Morticia Addams Nov 10, 1998 Fester reading an article by Dr. Pierre LeBlanc titled ""The Dangers of a Happy Marriage"", gets the family to try to help make Gomez and Morticia fight with each other. When he fails, he calls up Dr. LeBlanc who comes over and tries to steal Morticia from Gomez. So, Gomez challenges Dr. LeBlanc to a duel. Uncle Fester's Toupee Nov 11, 1998 Ginger, a girl Fester has been e-mailing is coming to meet him. But Fester lied to her about himself, and wonders what he's going to do about his hair, which he told her he has. So a toupee salesman is called. Fester's grand appearance in front of Ginger is stumbling at best! Lurch Learns to Dance Nov 12, 1998 We all know that Lurch is a great butler, but can he dance?...NO! When he is invited to the Butler's Costume Ball, Lurch refuses to go because of what happened at the last dance he went to. A dance instructor and then Fester and Gomez give Lurch dance lessons, and finally Lurch is persuaded to go. Morticia and the Psychiatrist Nov 13, 1998 Pugsley joined the Junior Troopers so Morticia called a psychiatrist who suggests that Pugsley just wants their attention. Melancholia Finds Romance Nov 16, 1998 Cousin Melancholia and her fiancee Digby Henson arrive at the Addamses house but Fester is suspicious of Digby so spies on him! Morticia's Favorite Charity Nov 17, 1998 The Addams are selecting stuff to donate for the charity auction but donate Pugsley's tiger-head clock, much to his annoyance! Morticia and the Ladies League Nov 18, 1998 Morticia invites the PTA over to her house for a meeting and Pugsley wants to go to the circus to see Gorgo, the flying monkey. Morticia's Dilemma Nov 30, 1998 Gomez' old friend Senior Don Xavier Malina arrives with his daughter Consuela and her chaperone Maria. When Gomez was 10, he had proposed to Consuela, and now that she is turning 25, Senior Malina is here to see them married. Christmas with the Addams Family Dec 7, 1998 Christmas is coming. The happiness of it horrifies the family, but the gift-giving and holiday spirit is still there. Pugsley sees his belief in Santa dashed, and the family enlists Fester to dress up as Santa for him...what a sight! Crisis in the Addams Family Jan 4, 1999 Gomez's finds out life insurance policy was cancelled because his shark feeding trip to the Bermuda Triangle was deemed too much of a risk - Mr Fielding, an inadequate insurance man, convinces Morticia that Gomez will die in six months if he doesn't change his dangerous ways! Gomez, the Cat Burglar Jan 8, 1999 Gomez gets hit in the head by a croquet ball and loses his memory, and so becomes distinctly Brooklyn-like! Close Encounters of the Addams Kind Jan 25, 1999 Aliens looking for a power source trace it to be at the Addams house. After researching TV shows from the seventies to learn Earth culture, they come posed as Greg and Marsha Brady. At the Addams house, they discover that the power source they need is Uncle Fester, and they have a dance contest with Morticia and Gomez to win him. However Greg and Marsha lose, but after explaining their case, Gomez comes up with a solution. Amnesia in the Addams Family Feb 1, 1999 gomez is hit in the head and is in amnesia. Morticia asks Gomez if he's ok and he reply's ""Gomez? Who's Gomez?"" Morticia looks at him and says that he's Gomez but Gomez is clueless about who she is. So he's in amnesia and try to bring Gomez's memory back.